For the beach lovers, pristine beaches of Goa are one of the world's most impressive destinations for holidaying. Paradise unrivalled- represents a powerful triad of sea, sun and sand. This beach capital is the most popular destination for relaxation and fun. For the ages this place remain the best destination for water sports, partying, enjoying food at beach shacks, or just lie down and relax. 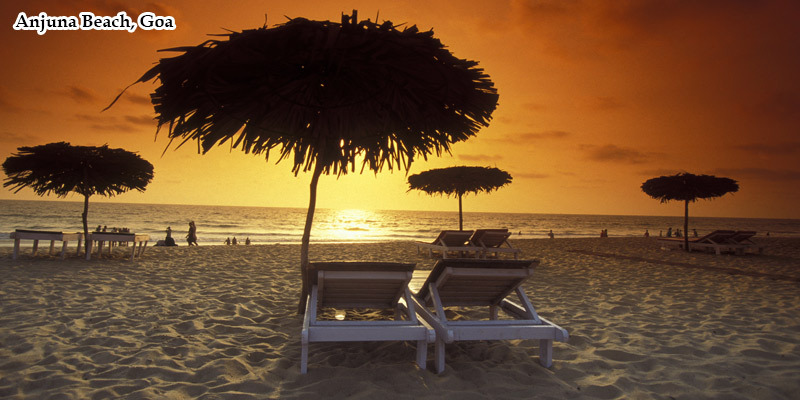 So pack your bags and head for Goa beaches for your next destinations. Arambol Beach is beautiful beach of Goa. This beach offer world class facilities for adventurous activities like snorkeling, para-gliding, kite-surfing and scuba diving. For the night birds, this beach offers amazing the jam session and rave parties. Regarded as the India's best swimming beach, Anjuna Beach is famous for its flea markets. One of the most frequented beaches of India is located about 18 km from Panjim and 8 km west of Mapusa. Situated at the distance of 10 km west of Mapusa, Baga Beach is located in between Colva Beach and Calanguate Beach. This beach is famous for the adventurous activities like para sailing, jet skiing, body boarding and surfing. Baga Beach is an extension of Calanguate Beach. Colva Beach is the very picturesque and less packed than Anjuna and Calanguate beach. Very popular in Goa, this beach will provide you the luxury of being with just yourself with all the world class facilities. Majorda Beach is yet another tranquil destination of Goa. Located just 37 km from the capital of Goa. Majorda Beach is famous for its bread baking industry. It's best to visit this place in between November to February. This place offers some of the best accommodation options in Goa.